APIR, in addition to the Office of the Registrar, provides official analyses and reports related to instruction and the curriculum. Variables include credits and student credit hours, sections, and courses as they relate to course subjects, departments, faculty and instructors, enrollments, and student characteristics. Analysis of grades and grade trends are also under the umbrella of instructional and curricular analytics. Analysis of instructional activity for departments by section counts provides another perspective on the curriculum. Clicking on the image below will open a visualization of common demographic variables of interest to instructors. 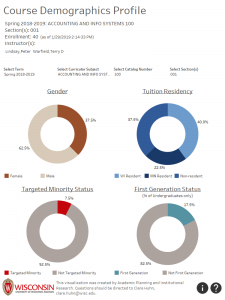 Additional reports that provide profiles of instructional activity by department, that include faculty counts, enrollments, and other dimensions analysis are under development. See also the Department Planning Profiles.